The only constant in this universe is that things change. Small changes very rarely require us to stop, take stock and our basic assumptions about our day to day lives. Larger changes, such as losing a job, a home, a loved one, or some other fundamental support in our lives, may require us to change the way we think about ourselves in the context of our lives, and thus how we proceed from here. There are three major variants of grief, expected grief, unexpected grief and complicated grief. When we know a change is coming, we begin to come to terms with that change prior to the actual change happening. Our process of change continues through the change, but the impact is frequently lesser than for unexpected or complex grief. A significant factor in the impact of the grief is how much choice we had in the change. Consider leaving a job, if you are fired unexpectedly and given four weeks notice the impact of that job loss is going to be generally greater than if you decide to resign because you have found a superior job elsewhere. Another example to consider is a relationship break up, the person who ends the relationship has usually spent some time grieving for the expected end of the relationship prior to the break up, while the person being broken up with usually doesn’t expect it and has done little processing. The point to consider here is who has already begun to process the end of the relationship rather than who did the breaking up. Another example of expected grief is a diagnosis of a terminal illness. Whether it is you or someone you love, knowing that they will die soon because of an illness gives you time to process that death prior to it. The impact is different to someone’s life ending unexpectedly. Elisabeth Kübler-Ross wrote a book in 1969 called “On Death and Dying“, where she detailed several phases or stages of the grieving process, which became the standard 5 stages of grief. She modelled this on the work she did with people who were terminally ill. The model is useful for most variants of grief and will be discussed a bit more below. Most change is rapid and clear cut. What was is no longer, such as a job loss, moving house, end of a relationship or death of a loved one. Sometimes the change is multi-staged or not so clear cut, such as demotion, living between houses, an on again off again relationship, a mental illness changing a loved one or some other medical condition such as acquired brain injury / stroke etc. Complicated grief can be thought of as trying to manage the change that happens in the steps between the beginning of the change and the end of the change. 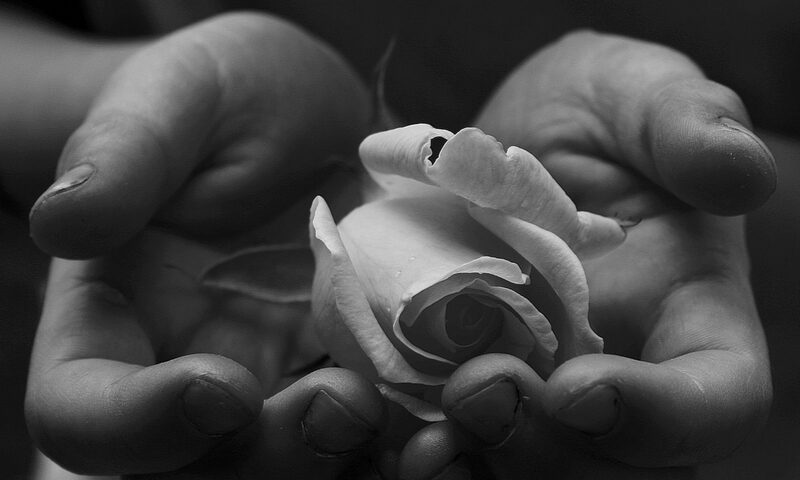 Let us take a closer look at what grief is trying to do for us. We humans simplify the world into an unique individualised “world view” model that gives us a simple “how to be” model. Our day to day actions do not require deep philosophical investigation, they are default actions that are drawn from our “how to be” model to fit our “world view” model. When a significant change occurs, we need to adjust the “world view” to incorporate that change, then adjust our “how to be” model to suit that “world view”. For example, when I am in a relationship, I tend to think in terms of “we” and “us”, yet when that relationship breaks up, I need to adjust my thinking to be “I” and “me”. How many people have stopped working for some organisation and still referred to what they do as “we”? Grieving is a process that transitions us from the before picture to a working model of after. Complicated grief is not a simple before and after picture. The change is not a clear cut difference, it is a gradual complex change that is taking time or hard to measure. There is a big difference between losing your partner to a break up or death, vs an accident that has paralysed them, or caused some kind of brain injury. You are grieving for the change in your “world view” that has a fully functioning partner, and adjusting to a “world view” that has a less functioning partner. This requires a “how to be” model change. A whole bunch of assumptions need to change, but it is complex. Another example can be losing a partner slowly to Dementia, a degenerative disease that slowly erodes a persons cognitive ability. Your partner becomes less the person you fell in love with and lived with all these years and is becoming something else… where was the clear boundary? What is the new change? Complicated grief occurs when there is no clear boundary between then and now, rather it is an erosion of the old and current into some unpredictable something. The grieving isn’t a process of updating the “world view”, it is a constant evolution or erosion of the “world view” and the grieving just keeps on going. 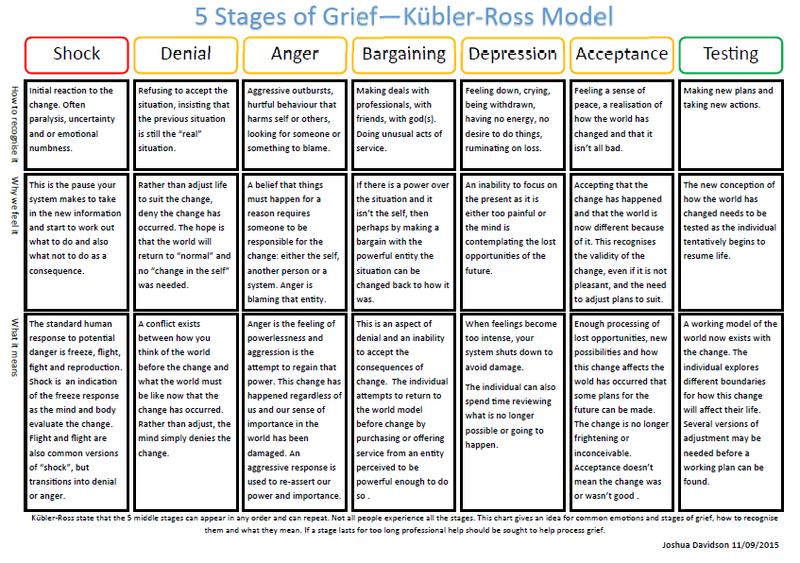 This worksheet breaks each of the stages of grief down into 3 layers. Frequently people are going through the stages of grief without realising what they are experiencing or why. I have included the initial “shock” and the final “testing new models” sections to help round out the process. Many people are poor at recognising what they are feeling and recognising the stage that is dominant within them at any given point in time. This section of the graphic helps an individual to recognise the most common cognitive and physical indicators for a particular stage. People can be in multiple stages at once. It is common to have aspects of all of the stages to some degree, however one or two stages will be dominant compared to the other traits. Understanding why we feel the way we do empowers us to do something with that feeling. It reduces the fear of feeling any stage as we understand how the event that created change has affected us and how this feeling reflects the stage of change. Each stage is a phase of change from before the event of change to the new conception of the world. While our “world view” is updated we may need to revisit these stages to allow let go of out dated aspects of our “world view”, erroneous aspects that we may have taken on board but now are disregarding, or adding new useful aspects to the new “world view” that we hope to end up with. Knowing how the stage adjusts this “world view” is an important aspect of accepting the changes. Fighting any stage will slow the transition down, leading to becoming stuck in an stage and not moving on. This can prolong the grieving process. While not one of the original 5 stages of change, it is often added as a prelude to the change. Shock is the recognition of change. It often sets us back and we can demonstrate this phase by running around trying to get facts, or sitting in stunned silence. We can’t plan – we just have to get it through our heads this change has happened. Some people process this stage very quickly, while others take quite a while. This stage can pop up as we recognise the enormity of what has changed in our lives. Denial is a refusal to believe that the change has happened. This is a safety step in our minds that slows down how rapidly we change our “world view”. Having a little denial or disbelief means we don’t prematurely change our “world view” and allows a small bump in our lives to settle back to “close enough” to our normal “world view” such that we don’t really need to modify our “how to be” model. Denial is a little related to shock – where we first learn of the change – but this is a different as we have had this information for a bit and we know intellectually that it is so, yet we emotionally can’t accept it and so we try to find a way to prove it isn’t so, or just point blank refute the “in the cold of light” evidence. Shock is more about being unable to cope with the enormity of change while denial is refusing to accept change that we recognise. If you find yourself stuck in this stage, it is important to review what has changed and look at some of the implications of what that change can mean. Denial is a tough stage to be stuck in as our instinct is to reject the reality of change in order to avoid adjusting the “world view”. The cost of change seems too high compared to pretending the change has occurred. The less choice we had with change, the less power we have to affect the situation. This feeling of powerlessness and victimisation frequently triggers an anger emotion. We feel helpless that this has happened and we feel violated. Anger is the emotion that tells us that our boundaries have been crossed, that something has occurred to us and we are in a position of weakness. We typically become aggressive to others, or to those we have lost, or we try to find someone or something to blame. We frequently aren’t very subtle. We find reasons to sustain our anger. Problems occur when aggression is turned out towards those who are wanting to help us, or are also trying to deal with grief. This can create isolation when we should be seeking comfort and understanding. Aggression can also turn inwards which can lead to physical and social self harm, suicidal ideation a diminished sense of self worth. Aggression, whether external or internal, is a quick attempt to regain power over a situation. Frequently in the case of grief, aggression makes no difference to the powerlessness of the situation. The change has happened, regardless of how aggressive you can become. Try to minimise the aggression and look at how your position of power has shifted, of how your boundaries have been crossed, and why you are feeling helpless. Once these are identified, you can begin to adapt your new “world view” to address these changes. Bargaining is related to denial. We try to find a way to change what has happened so it returns to the old model, which saves us from having to adjust our “world view” to incorporate the change. This stage makes more sense when you can see change coming (someone is leaving, the task is over) yet we do it with sudden loss too (what if I did this, or if that happened, what if we tried this other thing – then things will return to “normal”). Change is inevitable and you can never go back. You can just make a new thing. Yet we want the old familiar, comfortable old, regardless of if we loved or hated it. The depression stage has two aspects, a safety fuse to shut us down when we are overwhelmed, and a contemplation of the past. When the emotions are too much for us to bear, we shut down. This is kind of like the automatic cut off switch in electrical goods – it’s too much, so rather than being damaged, we shut down. We do less, we avoid stimuli, we find it hard to feel (whether it is emotional, sensory – like taste – etc), and we just seek to escape. Escaping can be to go away from things (holiday), or into another world (TV, computer games, books). The pain is just too great to manage at the moment and the depression stage is a really important safety switch. This is okay. It just means the rest is too hard right now and you need to regather your strength. Avoid too much stimulation, either physical or emotional. Avoid getting stuck in here – you have to go out sometimes and do a bit even if you don’t feel like it, but aim for bite sized portions and give yourself leave to back off and take a break. The other aspect of depression is contemplating the past, looking at the old “world view” and mourning of its passing. This aspect of depression is an important accounting of the past such that we can compare it to our new burgeoning “world view” and let the old one go. Mourning the past can be a problem when we become stuck in the past and fail to develop a future. Once the mind has reoriented to the change we have a new pattern of seeing the world and behaving installed. Our new “world view” has encompassed the change from how it was before to how it is now and we have a prototype model of “how to be” worked out that we are comfortable with. We have accepted the change, whether we like it or not, and we feel at peace. Hopefully this is the end of the journey, but often times it is a temporary reprieve as we realise that there is more to process. These models are prototypes and full functioning new “world views” and “how to be” models will take time to test and develop. Don’t be disheartened, it is natural to bounce between feelings. Once we feel comfortable with our new models, prototypes that they are, it is time to start living life again and testing the new “world view” and “how to be” models. There will be glitches, as with any new system, and adjustments will need to be made. This is perfectly natural. There will be times that you miss the way things were, and you may ounce back to some of the stages of grief as you adapt to the new models and adjust them to better reflect the changing world. That is a very human response to change. We miss those who have gone, hopes that have died, and opportunities that are lost. We can express this in the form of weeping, crying, keening, sleeping, silence and so on. To justify this pain, we often try to find someone to blame. When it is not possible to blame someone else, we turn the blame on ourselves. Either we did something that actually contributed to this change, or we didn’t. Either way, we will feel guilt. When there was no direct or significant act we did to cause the change, we try to find a reason to justify our guilt, seeking minor things we might have done wrong, escalating them to things that we did do wrong and would have staved off this thing that created change. People make decisions and you aren’t responsible for them. If it isn’t a person’s choice, then it is another random factor (rock falling on someone’s head, car accident, animal attack etc) that no one could have affected. Only if you point the weapon and pull the trigger can you be held responsible, and that is a legal matter we aren’t getting into. In the vast majority of times, it wasn’t you. Yet you feel like someone must be to blame, and in the absence of blaming another, you blame yourself. You have given yourself god like responsibility for the change, without god like fore knowledge to see it coming and god like power to have staved off the situation. This is not fair to yourself. Bad stuff happens. What makes us great is how we adapt to these changes. That is what got us out of the trees, lighting fires and creating computers. Adapting to change. It is important to take a cold look at the change, accept that it has happened and work out where you are going to go next, rather than becoming stuck on blaming yourself for what was beyond your control.